First off who were the Celts? The Celts, as an individual society and people, do not exist today; however, most of those with European descent have some Celtic ancestry. The “truest” Celtic bloodlines existing today belong to those from the Scottish Highlands, Perthshire, Northwest Scotland and the descendants of the ancient ruling families in Ireland and Wales. Even though Celtic tribes dispersed and intermarried with other cultures over many centuries, their rich legacy and historical impact remains prevalent today. (Read more about the Celts). Symbols used in Celtic Wedding Bands. The most popular symbol used in Celtic Wedding Bands in the Celtic Knot – a true Celtic Knot will always fold back onto itself with no beginning and no end symbolizing love never ending in marriage these knots are also known as an eternity knots. The Trinity Knot is also popular in Celtic wedding bands for the same reasons however the trinity knot is also a Christian religious symbol representing the three corners as Father, Son and The Holy Ghost. 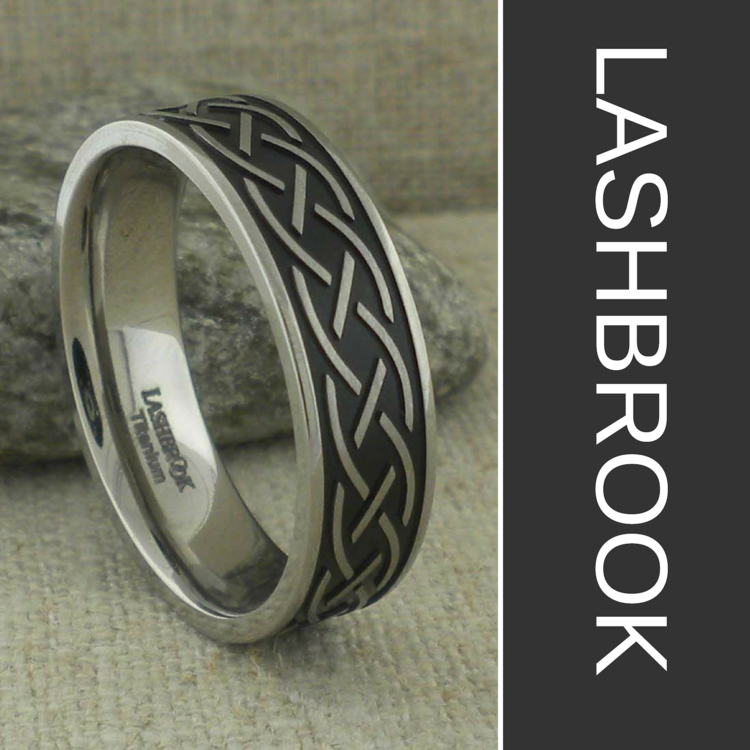 Other Symbols for Celtic Wedding bands are Celtic Spirals which are found mostly on stone monuments like Newgrange and symbolize growth and creation. The traditional Claddagh is often paired with Celtic Knots. The Claddagh is the Irish Symbol for Love, Loyalty and Friendship. Le Chiele or Celtic Swan symbolize togetherness and unity between a husband and wife (more on the Le Chiele). Ogham: Is also a popular text for Celtic Wedding Bands – Ogham is the ancient writing for the Irish Celtics and you can see many examples written on stones. Celtic Wedding bands that offer Ogham writing have wonderful phrases like gra go deo meaning love forever in Gaelic and Mo Anam Cara meaning my soul mate in Gaelic. These rings can be customized with your own special message. (more on Ogham). Metals for Celtic Wedding Rings: Traditional metals for Celtic Wedding Bands are Gold both 10K & 14K in either yellow, white or two tone. Sterling Silver is very popular but keep in mind that Sterling will require special care and will likely not last the length of the marriage because silver is the softest of the metals. 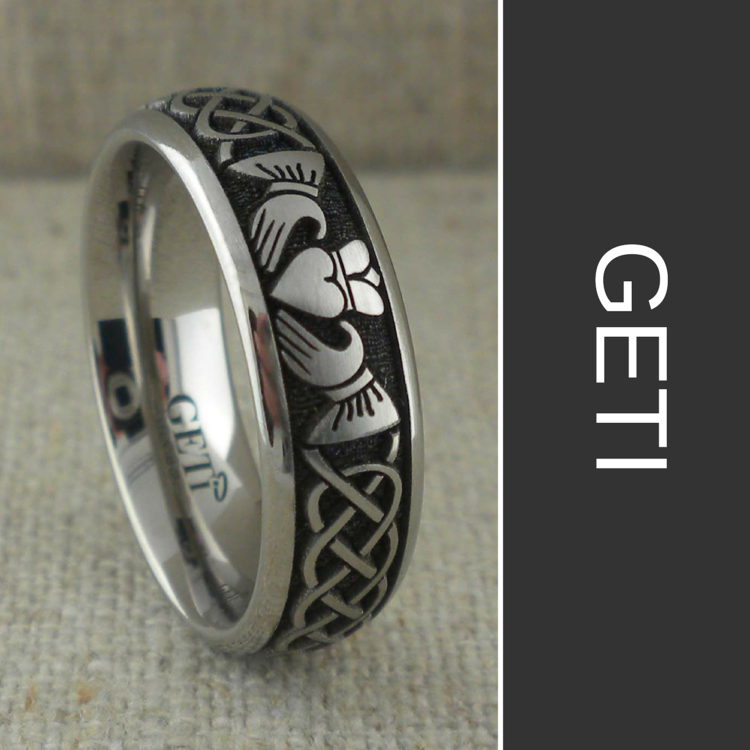 Most Celtic rings can be done in 18K or platinum as a custom piece. Celtic Wedding Rings are also available in newer high-performance metals like tungsten, titanium, cobalt chrome and zirconium. High performance metals are very durable and will last a very long time – they are available in a variety of designs, widths and finishes and are highly customizable. However, they cannot be resized and have no real value like the precious metals. Unique Celtic Wedding Rings a wide variety of Celtic Wedding Rings from awesome award-winning jewelers in Ireland, the UK and here in the USA.